The energy stored in hydraulic equipment can send failed components flying through the air with a similar impact to bullets. Hydraulic control is unbeatable for its power density and flexibility of use. It makes equipment move faster, with more power and more articulation than any other technology, and for that reason, it can be extremely dangerous. Add to this that fluid temperatures are often well above scolding temperatures and if leaks get near a heat source they can cause dangerous fires. Unacceptable risks - Any working environment where no risk assessment has been carried out or the people involved are not adequately or appropriately trained. Research or development environments working on new, or as yet, unproven designs. First-off system builds for machines that have not been made before. Large systems that are undergoing maintenance. Hydraulic equipment can present increased risks during build and prior to final commissioning sign off; including while equipment has been partially disassembled for maintenance, particularly if multiple engineers are working on the system at the same time. Manufacturing environments building production systems that have not yet passed final testing. Maintenance areas repairing and testing standard equipment. New equipment that is still in its initial trials period. Equipment that has exceeded its normal service period and is awaiting its planned service. OEM machines or proven equipment where no safety barriers have been deemed necessary. Equipment that has been fully isolated from any power supply, stored energy systems or unsupported loads. Hydraulic systems that retain stored energy while the power supply is turned off, will exhibit an increased risk. Systems which store energy in standby are likely to need to comply with the PED (the Pressurised Equipment Directive). Typical risks include hydraulic accumulators, which retain bladder charge pressure, even after all of the fluid have been released. Hydraulic cylinders that maintain pressure while supporting the load, or actuators that can also feed energy back into the systems. Wherever possible, it is good practice to design systems that automatically discharge the pressure and support the load safely, when not being used. With the exception of accumulator safety blocks that always need a certified relief valve, hydraulic systems do not generally fall under the PED, although always check if you are not certain with new designs. With Pneumatics the compressibility of air creates a real risk of uncontrolled movements or unsafe release. If air volumes are allowed to remain compressed within the system then extra safety measure will be required. Although hydraulic fluid is considered to be incompressible, it is actually slightly compressible and will change volume with temperature. This may not be sufficient to require compliance with PED but trapped in fluid must always be avoided as this can cause thermal expansion failures or dangerous fluid release, when fittings are removed and pressure has not been released first. Continued working at high-pressure, particularly if the loads are cyclic, may eventually exceed the recommended, and actual life of a component. Incorrect operation or other system failures may result in the overstressing of components, which could eventually lead to their failure. Make sure all equipment has been commissioned by an experienced hydraulics engineer. Pressure test new hydraulic equipment to 1.5 times working pressure, using a low energy pressure device such as a hand operated or low energy pump, before first off startup. Reducing the frequency oscillations or using ramped accelerations and decelerations to remove the harshness in direction changes should also extend life. Starting up, or when shut down can be some of the most dangerous times for working near hydraulic equipment. Particularly first off start-up or after large systems have been shut down for maintenance. It's vital to read and understand the equipment's safe start up and shut down isolation procedures, before completing any work. Uncontrolled movements or dangerous load conditions, others turning the power back on before work is finished, trapped in pressure, damaging negative pressures, loss of fluid or contamination entering the system. Full isolation and tagging, or locking of the main power supply so that no one else can turn them back on without your supervision. Check that all isolators, particularly tank return and drain lines isolators are open to tank before you turn the system on. Unload the system, potentially with the system relief valve, before you start the pump. Always check that electric motors have been wired correctly by first powering them for only a second, to ensure they send flow in the correct direction. Discharge all accumulators before you start to work on any equipment. Power up electrical controls to check them first, before you apply hydraulic power to the actuators. Make sure elevated loads are physically supported before you release the pressure. Never work near a load supported by hydraulic pressure alone. Whenever possible, stand behind a physical shield, away from working hydraulic equipment, particularly during startup. Always turn off the hydraulic power before adjusting the valve settings. 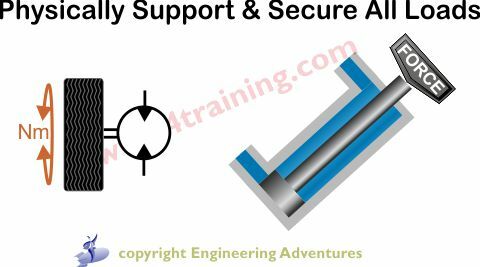 Follow the correct start-up and shut down procedure (see our maintenance training module for typical issues). Wear appropriate clothing e.g. glasses, steel capped boots, protective gloves, and overalls. It's good practice to provide a retaining wall around hydraulic equipment to ensure no fluid can leak onto walkways or into the environment. Physical barriers should be provided to prevent fluid jets coming into contact with the workforce. Of particular concern are areas where hydraulic systems operate close to heat sources. Hydraulic fluid is combustible and when high-pressure leaks form a fine air mist close to heat sources then fire becomes an increased risk that must be addressed by using appropriate guarding or fire-resistant fluid. Hydraulic hoses tend to be one of the components within a hydraulic system that are most likely to fail. They have been responsible for many injuries and therefore require special attention and safety precautions. Make sure that hoses are correctly installed with appropriate ends fittings. If people cannot be kept outside the range of loose hoses then end fittings should also be physically restrained to prevent whiplash from the flying, broken hose ends. Check hose dates are within predicted life limits, typically 5-7 years but this does depend on the environment and application, so can be shorter. Manufacturing dates are written on all hose. Take particular care of hoses that retain load pressure and the consequence of their failure would be a dangerous falling load. Replace whenever you see damage or wear to the outer surface. Never use reusable hose ends. Each workplace will have local safety issues and will have completed their own risk assessment based on these particular issues. It is important to be fully aware of their findings and follow any specific working procedures laid down by each individual workplace management team. These recommendations must not be considered the complete list of safety considerations, it is the equipment owners responsibility to consider each application in its own right. A typical hydraulic fluid working temperature is around 40-50 C. Electrical solenoids will be higher than this, potentially 70 to 100 C. Clearly, this can cause serious burns to the skin so the utmost care must always be taken when working around hydraulic equipment. Hydraulic fluids need to run warm to work efficiently but with large volume reservoirs and good offline cooling, it should be possible control the fluid temperature within close limits and therefore avoid the highest temperature extremes. 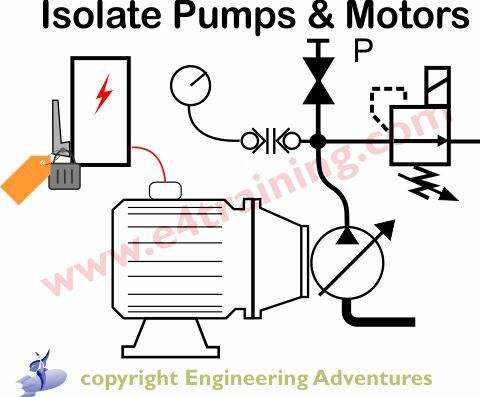 Solenoids require far more power to switch position than they do to continuously hold the valves in position. For this reason, it's often acceptable to use controls that reduced power to the solenoid once it has switched. This will not only reduce the temperature but also reduce your electrical energy consumption. Never put any part of your skin within 100mm of any part of a pressurised hydraulic system. Tiny holes in the skin of a hose, loose fittings or fractured pipe, for example, can lead to fluid jets, injecting fluid under your skin. This leaves very little visual sign of injury but if it's not treated immediately it can lead to amputation or death. This is a rare injury, but it is difficult to identify and few of the hospital's staff have any knowledge of the risk. It does, however, require urgent, specialist medical attention including surgery within 6 hours. See the BFPA website for an action pack with more information and notes to take to your nearest hospital. The following issues do not relate exclusively to hydraulic systems but are commonly found as part of the same equipment or machines. It is the employer's responsibility to ensure that workplace noise limits do not exceed legal limits. Above these limits, actions must be taken. For details see the HSE website . The main risks from electrical interface hazards are electric shocks, burns, fire or explosions. All electrical installations must be approved and maintained by a competent person e.g. someone who has the suitable training and has the skill, and knowledge for the task to be undertaken to prevent injury to themselves and others. Where machine interfaces cannot be shown to be 100% safe then physical guard barriers shall be considered. Machine Guarding requirements are covered by PUWER (Provision and Use of Work Equipment Regulations). Confined spaces can include areas below deck on a boat and within enclosed machine rooms or vehicle cowlings. Employers can purchase a copy of the code of practice for safe working in confined spaces from the HSE website . It is the employer's responsibility to protect workers from falls from heights. The HSE website provides a brief guide for employers and employees. Manual handling relates to the moving of items either by lifting, lowering, carrying, pushing or pulling. The weight of the item is an important factor, but many other factors can create a risk of injury, for example the number of times you have to pick up or carry an item, the distance you are carrying it, where you are picking it up from or putting it down and any twisting, bending, stretching or other awkward posture you may adopt while doing a task. Further information on potential injuries along with some free tools for evaluating the risks can be found on the HSE website . An employer must have plans in place for emergency response and evacuation. These are likely to include items such as raising the alarm, escape routes, crowd management, first aid, communication, and reporting. A full list of requirements can be found on the HSE website .